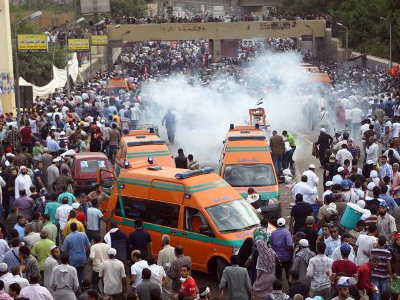 An Egyptian man has been killed in front of a luxury hotel in central Cairo after police opened fire on an angry crowd of around 500 people. The demonstrators set ablaze dozens of vehicles parked outside the hotel, and had tried to storm the lobby. 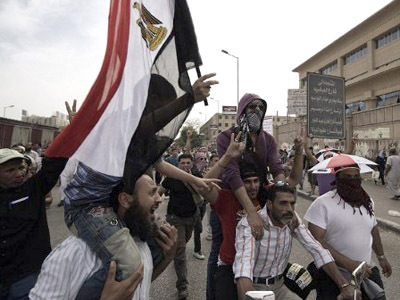 The violence broke out after a resident of poor nearby district, who had been hired for temporary security work at the Fairmont Hotel in Cairo’s Nile City Towers, was refused pay and prevented from entering the hotel by police on Thursday. He was shot dead as he tried to storm the hotel with a group of his comrades, local media report. The group, which was 500 strong, arrived from the nearby Ramlet Boulaq district soon after the man was gunned down. 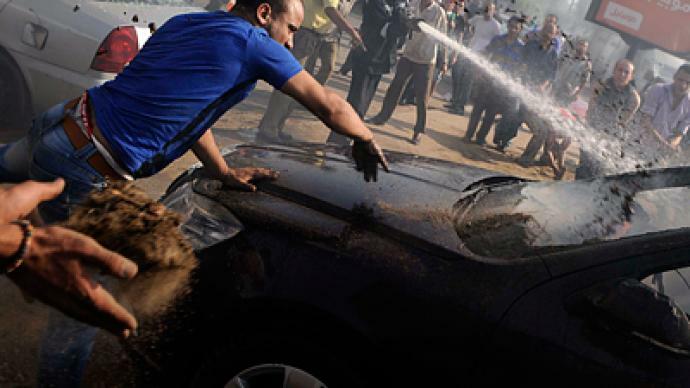 They set fire to several cars and motorcycles in the parking lot and tried to enter the hotel, forcing police to deploy tear gas and bird shot to disperse the crowd. Witnesses also claim that live ammunition was used, but these reports could not be independently verified. The tear gas spread from the clashes into a residential slum area, suffocating at least one young girl, according to residents. On Tuesday, the Fairmont hosted US Defense Secretary Leon Panetta, who was in Egypt for talks with newly-elected President Mohamed Morsi. The building has repeatedly come under attack by residents of nearby slums. On June 27, the tower’s staff reportedly refused to provide water to extinguish a fire in a nearby shack, causing outrage among locals after a five-year-old boy died in the fire.